More than 2,000 years ago, well before the Roman invasion of AD 43, Leicestershire was untouched by the brick and concrete buildings, maze of roads and neat countryside we see today. There was no dominating city of Leicester, no county towns and settlements were relatively small, few and far between. 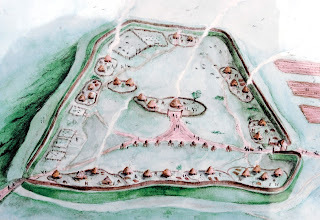 The major settlements in those days were not positioned where they are today, on the lowland plains of Leicester. Instead, they were on the top of Leicestershire’s higher hills. Through archaeological excavations, it has been discovered that Leicestershire’s Burrough Hill, Breedon Hill and Beacon Hill are all ancient hilltop settlements, commonly referred to as hill-forts. A hill-fort is a fortified refuge or defended settlement, located high above neighbouring plains, using its dramatic position for military advantage. They were designed to follow the contours of the natural hills they were built upon, and with the human addition of earthworks, ditches and defensive walls, they would make any bands of roaming warriors think twice before trying to invade the armoured camps. From the fifth century BC onwards, throughout the era known as the Iron Age, hill-forts flourished and were scattered throughout central and western Europe, including all over the British Isles. By the time the Romans arrived, they were more like small cities than fortified posts. Leicestershire’s three examples are some of the best-preserved hill-forts in Great Britain. They are as important to our county’s heritage as any other Leicestershire building made since. The colossal sizes of these hilltop settlements are tremendous feats of engineering, created by highly skilled people who did far more than just “survive”. Burrough Hill, about five miles south of Melton, is Leicestershire’s largest hill-fort. 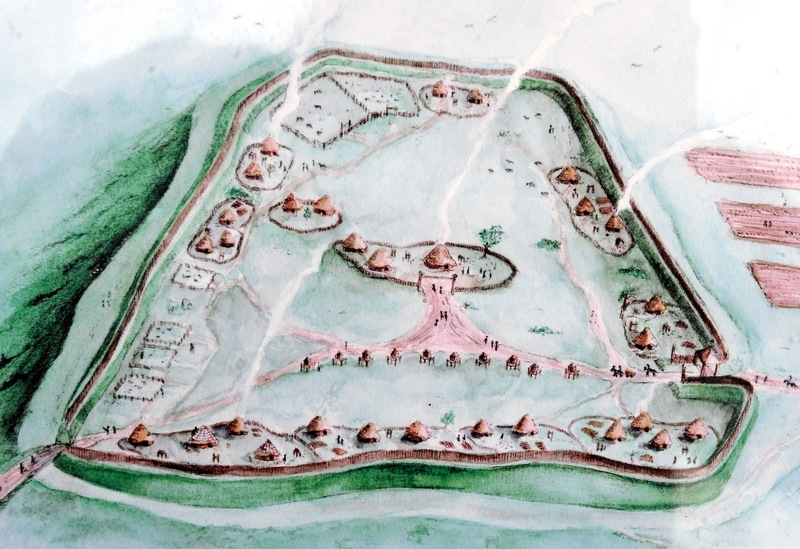 It is thought by some that this enclosed, 12-acre site was once the ancient capital of the East Midlands’ native tribe – the Corieltauvi (Coritani). Many of Britain’s hill-forts were the political, economic and social centres for the surrounding area. All the indications point to Burrough as having this sort of prestige in Iron Age Leicestershire. Situated on an ironstone ridge in the east of the county, Burrough Hill offers commanding panoramic views across both the Wreake and Soar river valleys and right across Charnwood Forest. You can even see other important Iron Age sites, such as Breedon. However, the history of the Burrough area goes back even further than was originally thought. 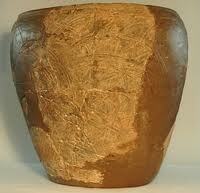 There is evidence that it has been occupied by humans since the early Bronze Age, approximately 4,000 years ago. In the nearby village of Somerby, the dates go back even further, thanks to the discovery of a very important flint axehead. This find alone could put the human origins of the area back to prehistoric times. For Burrough Hill, therefore, it seems the Iron Age hill-fort was just another phase in the area’s diverse history. However, it was during the Iron Age that the area was at its most powerful and influential. The fort occupied the 690ft-high hill and today you can still view the long inturned defensive wall (or rampart) which circles the perimeter of the site. The original entrance to the fort was in the south, and is seen today as a gap in the defences. Here the ramparts were turned inward, to form a tunnel leading into the centre of the enclosure. Evidence of a huge double-gate has been unearthed along with a guard chamber. Archaeologists have even uncovered a section of the original cobbled roadway which led through the gates. The current road from Somerby to Burrough Hill runs in a straight line towards the hill-fort’s gateway, and so could be a possible Iron Age or Roman road, like the famous Fosse Way. Archaeologists have found some great examples of Iron Age “beehive” querns, or corn-grinders, which were used in cereal production. Excavations of storage pits have even revealed remnants of Iron Age domestic waste, a rather exciting find due to the variety of artefacts such as broken pottery and bone fragments. The most spectacular find to date came from a 19th century excavation. A crouched skeleton, dating from the Iron Age and unmoved since death, was found in the fort’s perimeter ditch holding a short sword. Presumably he was an attacker who failed to breach the defences. He was joined by a further two skeletons after a dig in 1935, clearly showing that Burrough Hill was a great success as a fort. Breedon-on-the-hill is another of Leicestershire’s fantastic Iron Age structures. It is located in north-west Leicestershire, between Coalville and Melbourne, in Derbyshire. The original form of the hill is now almost completely destroyed by the vast amounts of quarrying in the immediate vicinity. But the quarrying has proved useful. If it wasn’t for this human destruction, we would not know half as much about Breedon-on-the-Hill as we do now. As the machines dug deep, the archaeology came to the surface. 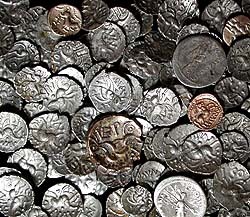 Finds here span just about the whole of British history. Breedon’s oldest relics are several stone axes which have a proposed date of about 3,000 BC. It is not surprising to learn that this strategic natural landmark was the habitat for early man. With easy access to the river valleys of both the Soar and the Trent, and a 360-degree panoramic view of the neighbouring lands, Breedon was a natural vantage point and a natural obstacle for enemies. The people who occupied this 400ft-hill are likely to have lived there into the Bronze Age. There was certainly a structure which stood on the hill before the main hill-fort enclosure. However, like Burrough, Breedon’s heyday was the Iron Age at approximately 300 BC. It is around this time that the hill-fort seems to have been constructed, to make the hill a strategic, defensive settlement using a combination of ditches and ramparts. There is clear evidence of localised work on the rampart, implying that the fort was always kept in good repair. It was too good for two unfortunate souls whose skeletons were excavated in the boundary trench. Sadly, the quarrying has now removed more than half of the original hill-fort structure and excavations have been limited. What we do know, though, is that during the Iron Age, Breedon was a major producer of a distinctive pottery type – Ancaster-Breedon Ware. The same type was also found at Burrough Hill, evidence of a possible trading route. Cereal was also produced at Breedon, proved by a find of some 20 corn grinders, an unusually high figure for any Iron Age site. Another unique aspect to Breedon is that the occupants may have also had a system of religion. A rare, miniature bronze oval shield has been found which archaeologists often associate with Iron Age religious enclosures. 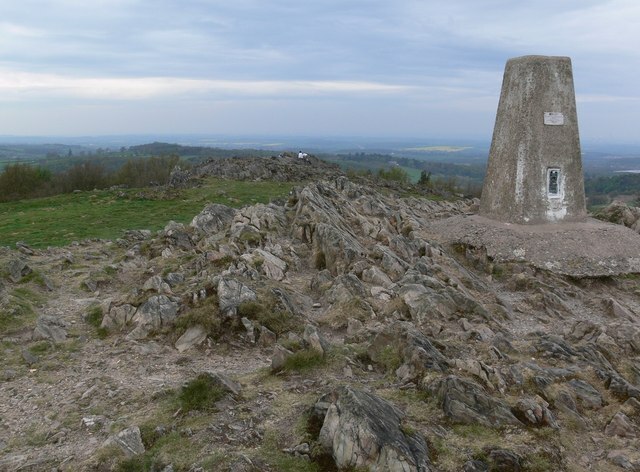 Leicestershire’s third claim to an important ancient past is Beacon Hill. Standing at a height of 813ft, it is one of several “Beacon Hills” in the United Kingdom, and many more around the world. The majority take their name from their use as sites for warning beacons in ancient times. With a history dating back to the late Bronze Age, Beacon Hill offers spectacular views over both the river valleys of the Soar and the Trent. Interestingly, part of the cliff face offers a striking resemblance to the profile of a human head. Known as the “The Devil’s Face”, its form is similar to the mysterious stone heads of Easter Island, but its name may offer a much darker significance perhaps. As an archaeological site, Beacon Hill is no older than Burrough or Breedon, but the importance of this site is that it is Leicestershire’s oldest hill-fort. In 1858, a late Bronze Age metalworker’s hoard was discovered which included two spearheads, a looped socketed axe and a socketed gouge. A bronze axe mould and a bronze bracelet were also found in a nearby location. With all of Beacon’s diverse and exciting ancient finds, you may be surprised to learn that no major excavation has ever taken place here; they were all discovered by chance. So what else might the hill be hiding? The axe mould that was found shows that the hill might have been a sight of bronze production. Excavations could confirm this and, like the spectacular bronze bracelet, many more precious artefacts could be brought to the surface. 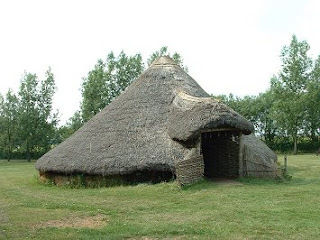 All the known artefacts are from the same period of time, and it is safe to assume that this hill-fort was built in the late Bronze Age, predating Leicestershire’s two other prime examples. Indeed, the defences do look slighter than the classic Iron Age hill-forts of Burrough and Breedon, but it may be that they all thrived together during the same era. The bank and ditch of the hill-fort is near the top of the hill, and can be easily traced for about two thirds of the perimeter. The remaining third was made up of natural outcrops of rock. Archaeologists admit that although all the finds are from the late Bronze Age, there is no way of knowing when the earthworks were constructed. The actual beacon tower which stood on the highest part of the hill has long since disappeared, but we have a description of it. In 1808, it was described as “an erection of rude and ancient masonry, about six feet high of a round form and having in its centre a cavity about a yard deep and a yard in diameter, the sides of which were very thickly covered with burnt pitch”. There is no way of knowing now, how old this structure was. The fact that it resembled a phallus, though, is no surprise. Phallic statues of this description were important fertility symbols to our pre-Christian ancestors and can be found all over the world, especially in South America. Leicestershire’s three major hill-fort sites are potentially the most important historical monuments in the county. It is hard to believe that no major archeological work has ever been conducted there. Further work has the potential to take the ancient history of Leicestershire to another level. But until that day, why not take a stroll through one of Leicestershire’s most ancient of places? With all three sites open to the public, a walk through a hill-fort offers a walk through thousands of years of history. Many types of buildings would have stood within Leicestershire’s hill-fort enclosures, but it was within the thatched roundhouses that general domestic life took place. Inside was a central open fire that was maintained 24 hours a day. It was used not only to cook food, but was also for warmth – a primitive but effective form of central heating. The women would have looked after the houses, with duties such as cooking, weaving, pottery-making and raising the children. Men would have been the providers, responsible for the farms and also for hunting in Leicestershire’s dense forests. Each man would have had a certain skill such as metalworking, stonemasonry, building or carpentry, and all would engage in battle training so they could protect the fort from potential enemy threats. For entertainment, activities included drinking, playing music, singing, dancing, and arts and crafts, while stories of gods, goddesses and epic battles would no doubt have been a favourite among the children. Primitive games using carved pieces and glass beads were also widely used. The people had their own unique dress style consisting of close-fitting trousers (braccae), a long tunic held at the waist by a belt, over which was worn a cloak that was fastened at the shoulder with a brooch. Textiles were dyed bright colours with a woven or striped pattern, and accessories such as brooches and pins were commonly added for function as well as decoration. Both men and women grew their hair long, sometimes plaited and all the men sported long beards and moustaches. Each year crops of wheat, barley, rye and oats were grown, and were used for such foods as bread and porridge, as well as a drop of Iron Age beer, of course. Other natural food sources were edible berries, leaves, flowers, nuts, roots and vegetables. Livestock helped with heavy farm labour such as ploughing, but were also a valuable source of food, manure, wool and hide. Domesticated animals such as horses would pull the carts and chariots, while dogs assisted their masters in herding and hunting. The four important days in the pagan calendar were Imbolc (February 1), Beltaine (May 1), Lugnasad (August 1) and Samhain (November 1), all of which have an agricultural significance and were richly celebrated with feasts, rituals and offerings to the gods. I just came onto your post and found it quite interesting. I am also associated with heating birmingham, plumbers birmingham, central heating birmingham and love to enjoy the stuff on the same as its rarely found on internet. Thanks again for writing such a good post.